There were 8 posts published in November 2006 (this is page 1 of 1). kids posing for me near Savanadurga. Their curious faces and shining eyes makes me nostalgic and jealous. the ones that betrayed you. they can redirect our life into all possible directions. what is a wrong decision ? something which makes us stronger. i thank my wrong choices. forced me to take them. do you believe in them ? and then the next day morning you find any of your loved ones dead. life is full of coincidences with mathematical precision. 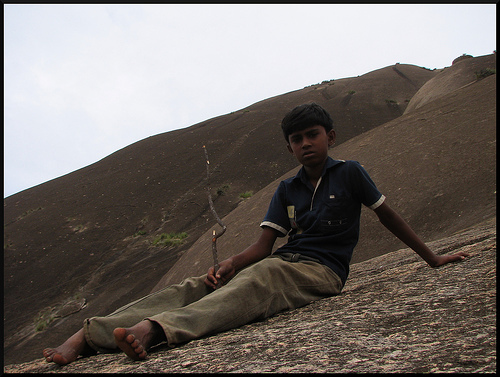 Lets dedicate this children’s day to Narasimma, the amazing kid whom we met at Savana Durga. When we reached Savana durga, few boys wearing shabby dress approached us and all of them told us that they know the whole area and they can be good guides. Only one boy had combed hair and he was wearing torn but clean dress. We were surprised when we found that he could speak Hindi. The boy had picked up Hindi from school. We asked him to come with us. He reminded us that there won’t be any water available at the top of savanadurga and he made sure that we have enough water and food, he kept our helmets in a nearby shop and Alas! our little guide took as to Savanadurga. He told us the stories of Bangalore, How it became Bangalore from “Bantakkalooru”, He told us about Kempe Gowda and how he stayed on the top of the hill and defended the enemies. Oh! yea he told us about the modern politicians also. He had the details like how many acres of land they have, how corrupt they are etc. Narasimma’s ambition is to become a Doctor. The boy’s eyes were shining when he told me his ambition. He studies well and he is rank 2 in his class. He told me the story of a boy who went to Bangalore from his village to study in some medical college in and died of some disease. He takes the role of a guide twice a week and the gives the money to his mother. They buy food for themselves and for the cows with this money. At times he gets sweets and dress for his little sister. What makes Narasimma different ? His eyes which radiates strength and hope ? I don’t know but I have seen his eyes sparkling when he was talking about his ambition. I have seen the hatred in his eyes when we described the the politicians, I could feel the love when he was talking about his little sister. I hope that one day the boy will complete his schooling and then go to Plus two where he can learn everything in ‘Englishu‘ and then One day he finds admission in a good college and becomes a doctor. Can we call this child labour ? Yes we can. But …..